Wonderful top floor condo with some great recent renovations! The kitchen is beautifully remolded and fully equipped. Enjoy a breathtaking Florida sunset from your private balcony directly facing the beach and the Gulf of Mexico. Your master bedroom has a door to the balcony and a large window facing the Gulf. After a day spent on the beach, let the sound of the waves lull you to sleep. 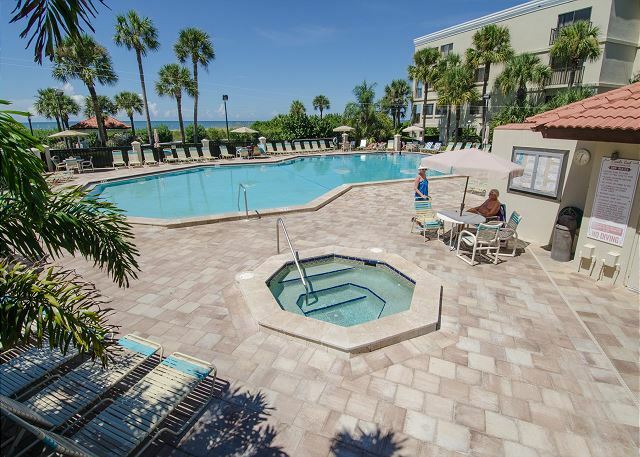 Your condo features tile throughout 3 flat screen televisions and free wireless internet. Lands End is a very nice place stay. This condo is very nice on the top floor. Could use a few up dates the couch is ripped, the sliding glass doors don't lock very easy and kitchen sink faucet should be replaced. The amenities are awesome and the view of the gulf is excellent. All ready have are next trip planned going to a different condo. Thank you for your feedback from this stay and we will definitely take a look at the items you have listed here. Thank you for being our guest and we look forward to your return visit to Land's End!! a guest from Georgetown, TX does not recommend this vacation rental. 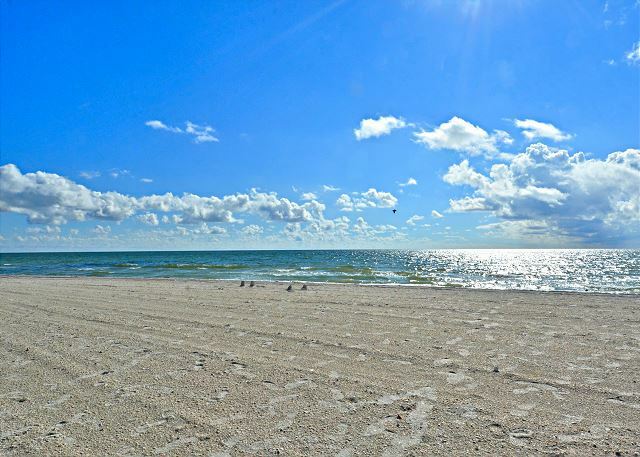 We love Treasure Island and the St. Pete's area. Land's End is a great location off the beaten path. There are several issues with the unit and the ad for the condo. The condo does not have a heated pool or at least it was not turned on while we were there. The gated aspect of the condo is a plus. The condo rule enforcement is a double doubled edge sword. The unit itself we have stayed in before 2 years ago. 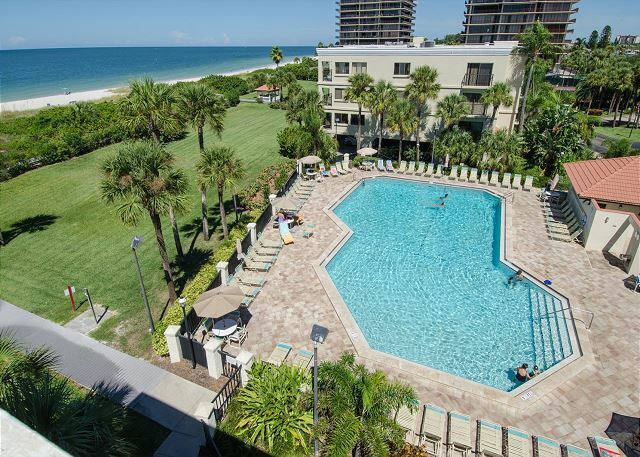 The unit is in the perfect location, close to the beach and pool. The bedding is very old. The couch has a large rip in the leather. The wifi is spotty at best. Closet door fell off hinges after one use. Pots and pans are old. Frig and microwave work well. AC is adequate but the instructions to turn off and on will result in a hot unit. The unit needs to be updated. Thank you for this feedback from your recent stay and we will be sure to share this with the owners for the review. Please do not hesitate to contact us at our office if there is anything that may need to be addressed and we would be more than happy to get that taken care of for you. We want you to be totally comfortable during your stay with us so please let us know if there is anything you need. In regards to the pool on site, it is heated and monitored by the condo association. They normally do not turn it on until closer to November, we are sorry if it was too chilly for you during your visit. We will take a look at the other items you have listed, thank you for letting us know. We have quite a large inventory to choose from at Land's End, if this condo was not the right fit for you we are sure we have another that is!! Please let us know if we can be of assistance for your next visit to our area. We have been staying at Land’s end for years, and always love it. We have rented lots of different condos. This one was nice. We had a few issues. The master besroom’s mattress was great, but the bed was on a platform frame. If you got up at night, you had to be careful not to walk into it. The beds in the guestroom wear so hard, and kids slept on the sofa. Guest bathroom needs a new flush valve. Had to lift lid to flush sometimes. Pest control would have came in with their keys . We happened to be there. Gentleman spraying was nice, but don’t leave valuables out in open. We are glad you enjoyed this beachfront condo at Land's End. It is true that the community has regular pest control throughout the community, we really need to keep up with that here in FL and the condos are someone's private residence so this is something that is done year round. There are postings on site when that is to be taking place but we are sorry if it caught you off guard at all. In regards to the bedding, we do understand that everyone's preferences there do vary but we will be sure to take a look at the beds in the guest bedroom. Thank you for being our guest at Land's End and we hope to see you back for another visit soon!! We booked our condo of choice back in January 2018 for our visit at the end of May. A few weeks before our arrival date, we received an email advising the unit we had reserved was having the deck railing replaced. This unit, 404-9 was the replacement offered. The shower curtains were dirty, no dresser in the second bedroom. Door knobs on sliding doors on wrong panels, making it hard to open. The fan in the hall bathroom completely died; the light above the shower didn't even have a light. It had ceiling in it. Other updates to the condo were nice, but we won't stay at *this* unit again. (Love Resort Rentals and Land's End though). a guest from Fort Calhoun, Nebraska does not recommend this vacation rental. We were told only of balcony repairs on this property, (we were moved from our preferred condo). Door entry DOES NOT lock behind when closed as informed. We were not told the boardwalk was closed. We were also unable to walk up the beach due to large equipment and repair we were not informed of. The leather couch in the condo was dry rotted and falling apart, dead moths by the sliding door, the sheets were covered with piling, we had to put in a lightbulb to see the washer/dryer and this information was all shared with the Resort Rental agency. Having been guests of Lands End for 20 years we were greatly disappointed. We believe new cupboards do not make a unit premium. The rental agency should make intermittent visits to the units to confirm they are as stated. We enjoy the St Pete’s area tho this was a long uncomfortable 2 weeks. We are so sorry to hear about your disappointment from your past visit to Land’s End. We modified and moved guests as we were made aware of the construction projects date modification, we never wanted to have to move anyone at all as we completely understand our guests choose the condos that best fit their needs, but the work being done unfortunately is out of our hands and we tried to accommodate as best we could. In regards to the beach work, this is a project that was being done through the federal government and they do not notify us in regards of modifications. The work on the beach during your visit here threw us all off guard as we were originally informed that the work was due to be completed by the end of May; that in fact was not the case and we truly apologize for the unexpected work there. We will take a look at the interior items that you have listed here as well as pass the feedback onto the owners for their review. We are sorry if you feel we fell short with you in any regards, being the middle person in these large projects makes it difficult as we are not made aware of every change taking place but we do try our best to accommodate as we can. Overall we were quite happy with this property. Appliances were clean and newer. The beds were comfortable. Pool was nice. So great to hear, we are glad you enjoyed this beachfront condo at Land's End! Come back for another visit soon!!! Great condo! Very clean and accommodating in all aspects. Resort Rentals was great to work with and I highly recommend them. We also used Sharky's for umbrella and chair rental, which I also recommend! Wonderful, so glad everything was a success for your vacation!!! We are so glad you enjoyed this premier condo in our program and hope to have you back for another visit soon! Clean, great amenities! Fantastic views, all around really good! Will come back! We love it!!! :-) We are so glad you enjoyed this premier condo in our program, the owners really did a lovely job with the updates and we are all so happy you liked it! Thanks so much for staying with us and we look forward to your return visit to Land's End!! Comfy beds, lots of dishes and silverware (don't have to run the dishwasher all the time), great view from 4th floor, close to pool, clean, well maintained. Wish the Wifi would reach to 2nd bedroom. We've been here before and will be back. We are so pleased to hear you had another good stay at Land's End! Glad you liked this premier condo, the owners really do a lovely job with it! :-) Thank you for choosing to stay with us and we look forward to your next visit! Loved the location especially. Looking out on the Gulf is a treat for land-locked Ohioans. Missing remote was replaced asap. Door lock gave us problems which Mark fixed quickly. May need more work though. From check in to check out everything was a smooth process. Condo was everything it was described as when booking. Location was perfect, condo was perfect. I would rate it a 10! Look forward to using this location again when returning to St. Pete. Once again we felt we were in paradise! Weather was perfect, beautiful sunsets, and we enjoyed the beach so much. The condo was clean and well prepared as always. We spent many hours sitting on the balcony soaking up,the sun and the view of the ocean. second time we have rented through Resort Rentals and they once again proved they are the best. Everyone and, I do mean everyone, goes out of the way to be helpful. The slightest request is handled quickly and effortlessly to our complete satisfaction. They are Number One!! Thank you so much for your post and kind words, you are too sweet!! :-) We are more than happy to help in anyway that we can! Thank you for staying with us, we love having you and are looking forward to your next stay! Not to be Repetitious but Another Visit to Paradise! You guys are the best. Arrangements were perfect, Land's End is becoming our second home and we had another great visit. I am still confounded by your ability to keep the sun shining day after day! Thanks Janet and the entire team at Resorts. Awesome, we are so glad you enjoyed the settings we had programmed for your week! ;-) Looking forward to your next visit!! spectacular. The condo clean and everything we would want in the way of comfort. Very nice. Could not have going smother. It was a beautiful week, and a wonderful time for family sharing. Our accomadations could not have been better. Thanks so much for the post! :) This condo is one of our premier units and it is just lovely! We are so glad you enjoyed it and made some wonderful family memories! We hope to see you again soon!!! We loved the condo & the location. The condo was updated & clean. The beach was not crowded at all & the views of the sunset each night were beautiful. We liked to stroll the boardwalk in the evening & watch dolphins in the bay. I would definitely stay here again. Easy, fast, efficient and straightforward. Have been coming to Lands end since 05 this is the nicest condo yet(never had a bad one) newly remodeled right by pool best view of gulf we have ever had. All tile floors was nice too. This unit will be my first choice from now on. Our trip was during Tropical Storm Colin. We had booked a stay at the Caprice, deciding to try something new; when the storm hit, we had some water issues in the bedroom so we requested to be moved to Lands End as that is where we normally stay. Resort Rentals was very responsive and professional and had us moved by noon the day we called! Condo was perfect as well! Lovely condo with perfect views and appealing updates. Comfort and good looks in all the furnishings. Land's End is always a wonderful beach and pool experience and we enjoy coming there. Only wish the rental's could arrange for beach towels!!!! The beach toys provided we a plus and the beach chairs adequate. Tennis court was also enjoyed. Our family had three condo's and this was tops. We find lots of good restaurants and the Publix is convenient. It would be good if Land's End could add more outside grills for those stay at home nights. The condo is well equipped for cooking. Excellent location for a family gathering. Very quiet and nice. We had a perfect week in paradise! To dream for weather and the most beautiful view from our balcony. This is our 3rd visit to this particular home and our 6th time at Land's End. Quite simply, it feels like home. 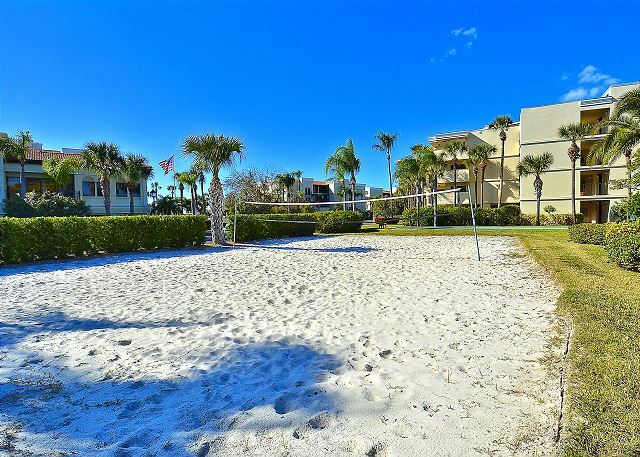 Great beachfront location, great area, wonderful unit. We'll be back! Terrific stay!! Very comfortable and relaxing!!! Love being right there on the beach!!! Only quibble! Wish the water pressure was stronger for showers! The condo has a tremendous view of the Gulf! We watched dolphins from our bedroom and was lulled by the ocean crashing outside our window. Lands end is a quiet condo association. It would be perfect for a couples get away. As a family with 2 small boys, we felt that we had to keep them quiet. The feeling we got from being staying there for a week is, Lands End is a retirement community. There was construction going on two units down from us. The workers were considerate and pleasant. The boardwalk out to the beach was easy to navigate. It was a nice get a way. We had perfect weather, a beautiful view of the ocean from our balcony and a lovely, comfortable condo to stay in. So relaxing! Stellar!This is the third unit we visited in the complex and it was, by far, the nicest. Location, Condition, amenities....all top shelf. The owners and Resort Rentals are fantastic. We'll be back! I have stayed at lands end for years love it. I did have about 3 issues o.k. 4 but for the most part management responded to all the issues I brought to there attention. Thanks for your review. I am please to hear that you have stayed with us for several years. Repeat business is the best compliment we can receive. I do apologize for the issues you encountered this year but am glad we were able to resolve them. Thanks again and we look forward to seeing you again next year. The condo was amazing, everything was exactly as pictures showed. Felt like a home away from home. Beds were comfy, plus the couch was very comfortable. Loved the decor & everything about Lands End. Everything was extremely clean throughout the property as well as inside the condo. Pool area was not crowded at all or the beach area. Highly recommend bldg 9, 404. We vacationed with some friends who visited our condo and they were highly impressed with our unit. If I had to complain about something it would be the sheets didn't stay on the mattresses very well......only the corners would come off, we fixed it in the am & all was great. Enjoyed our stay. Condo was clean and well equipped. This was my third year at Lands End and, again, it was an excellent experience! The only issue I had was that the comforter in the master bedroom, the accent pillows, and the living room accent pillows had an odor indicating that they had not recently been laundered. I called Resort Rentals and housekeeping was there that afternoon and removed the items to be laundered. Very Fine - as it has been several times previously. Super location,beautiful apartment,nice employees in the office and at the entrance, very relaxing! This was our second trip here this year and our new regular place to return to. This is a great condo in a very nice, quiet complex. The pool is very nice and our building was right next to it, but quiet. We had a spectacular view of the Gulf. I liked the walkway around the complex. The condo was clean and well furnished. We were very satisfied with our stay and would return. The location is great, about a mile off the main road at the end of Sunset Beach. Another great unit, well updated and convenient to the pool. Fall is a great time to go, almost like having the complex and beach to yourself. Resort Rentals,they make it so convenient to pick a unit, check in,and check out. Couldn't make it any easier. See you in Spring. This unit is one of the best units we have stayed at since coming down here for the past 12 years to Lands End. We would definitely rent this unit again! Love what they have done to upgrade/remodel this unit! Enjoyed our stay immensely! Very nice unit.. Clean and updated. Would recommend this unit for anyone. This was our second year at Lands End. The unit and the property were immaculate. Pool and beach were slightly more crowded this year, but still not as crowded as other beaches in FL. The area could still use more shopping and a few more upscale restaurants. Resort Rentals check in/out is a breeze. 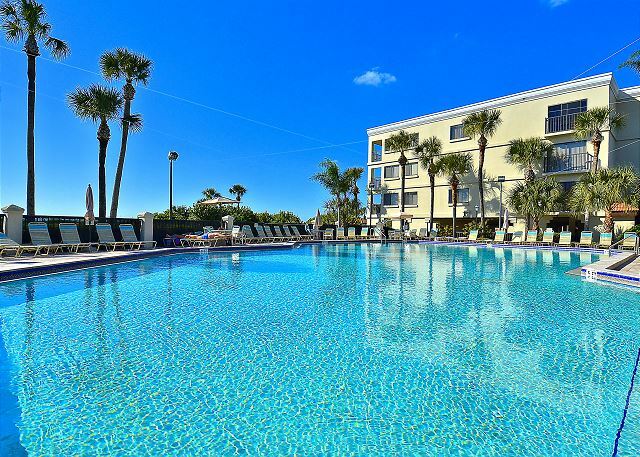 I would highly recommend the area and this property for families who want a quiet atmosphere and spend most of their time at the beach and pool. Was extremely happy with our experience. The pictures of our condo were EXACTLY as shown. Everything was perfect. Will most definitely come back. No complaints from our family, 13 year old son, 20 year old daughter, my husband and myself. Two thumbs up! Another great stay at Land's End! We had a fantastic weeklong stay in June. Our condo was very clean. Property is beautiful and well kept. My husband loved the nature walks in Honeymoon and Desoto State Parks. My 10 and 6 year old loved the pool and the beach infront of the condo. We enjoyed our visit to Busch Garden, Honeymoon State Park, Caldesi Island and Desoto State Park. We were very sad to leave. We will definitely be back. Everything in this condo has been updated beautifully. The only complaint we could connect to their network, but never to the internet. Also, the tv in the front room wasn't working great and a dvd player for the kids would be nice. That being said this was our 4th year at Land's End and this is by far our favorite condo. We will rent this one again! Thanks for your review. I appreciate the high ratings! Next time if anything is not working in the condo, please let us know. We have no problem revisiting a property to make things right! Thanks again and we will see you next year. We heard from other Land's End renters that their broker had poor cleaning staff. What a contrast. Our lady did an excellent and thorough job. We have been to Lands End the past three years. This property was the best one so far! It was in a great location next to the pool and beside a walkway to the beach. Everything in the condo was updated and clean, including bathrooms and kitchen, along with all new furniture. The only thing we felt was needed was storage for clothing, both bedrooms did not have dressers. There was shelving in the closets that we used instead. ******UPDATE****** A new dresser has been added!! Thanks so much for your review! Overall, we were very satisfied with the location and view. Unfortunately, the cleaning crew was not very thorough. It appeared that they only "spot-cleaned" prior to our arrival. However, I would recommend the unit assuming that the poor cleaning was an isolated incidence. Property very nice. Needs to have more washcloths and trash bags in house. 5 cloths for 2 people for a week don't last long. Gate attendants well versed in intry process. Picking up and dropping off keys after hours easily done. Gulf view and top floor were very much appreciated. This is our 10th year at Land's End. We have made this trip annually and have gotten to know many of the security guards and owners. Unfortunately, this year there was an owner who is also the head of the HOA who did nothing but complain about everything. Every evening at 8:30 he would call and complain about the noise at the pool. In return the guards would have to come and let us know. The pool is open until 11 so I don't understand how a complain regarding noise can be made when the pool is open. (There were 2 3 yr old and a 4 yr old in the pool, it wasn't loud). I feel this issue needs to be addressed because the other owners will loose returning quests because of this. As for unit 9, 404, it is just beautiful! It has been updated and has everything you would need and more. Only complaint is that the water heater is turned down a little too low and your shower is warm at best. We will can't wait for our trip next year and have already booked this wonderful unit!! The unit recently had extensive remodeling which was appreciated but the bedrooms lacked any drawer space and the rugs were very worn. Once again, a very good stay at a very good place.